We made the Bergen Record! These are some of our angels who graciously posed with a copy of the paper. 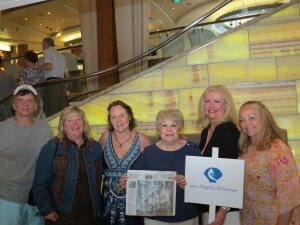 The travel section showcases people on their travels holding up the Bergen Record in the picture, as you see here. The sign you see here was our official sign for the group to find us. The photo was included in the actual print piece of the Sunday paper.